A seemingly innocuous observation on the part of Bouc in Chapter 3, this statement to Poirot foreshadows what is to come, and Poirot is shrewd enough to notice this. In an international train station, all the nationalities and types of people converge. The only other place in the world that was like this at the time was the United States, and Ratchett is a lone American amid all the other people. He stands out because of this. As Poirot thinks about this, he realizes that Ratchett is an American and The Armstrongs are an American family. This could not be an accident of timing and place to Poirot, and this helps him solve the murder. This quotation is evocative of themes of logic and reason as these faculties support Poirot. Mary Debenham says this to Colonel Arbuthnot in Chapter 1. Poirot observes this even as the two attempt to act like strangers. He overhears these words and sees the discrepancy between the performance as strangers and the obvious signs of familiarity between them. Poirot takes notice of two important things from this quotation. He sees that the two are in fact quite familiar with each other, and the fact that they attempt to act like strangers marks them as suspicious. Second, Poirot pays attention to the fact that something is about to happen when she to wait until it is over. Clearly they are involved in something. 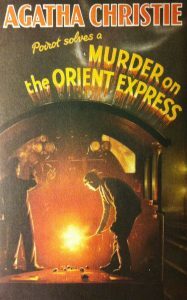 Once an incident occurs on the Orient Express, Poirot understands that they are likely involved. This line, spoken by Colonel Arbuthnot in Chapter 8, in many ways sums up the novel. This comes in conversation between Arbuthnot and Poirot in which they discuss the validity of the jury system versus private vengeance. Since the murder of Ratchett is in the end an act of private vengeance carries out by a jury of 12, the claim here is made complicated and ironic. Arbuthnot’s statement would seem to validate upholding the strict letter of the law. Yet the actions in the novel validate, in some measure, the demand for private vengeance. The novel never preaches either side to us. It leaves our moral bearings undecided and it is up to us to decide how true justice is to be carried out and under what circumstances.